When Whangaehu School principal Trish Reddish applied to get some money to buy some picnic tables for her pupils to eat their lunch at, she was denied. Pupils had been cramming into a small sheltered area in the school and Reddish wanted the tables for the growing school to make lunch a more enjoyable experience for them. But, to Reddish’s delight, she received a message out of the blue from one of the people who denied her request. “She [Soana Pamaka] is the principal at Tamaki College in Auckland. “Her boys [at Tamaki College] had got some funding for trades work in the school. The students who were doing woodwork. They’d got a grant to create picnic tables for their school in Auckland. 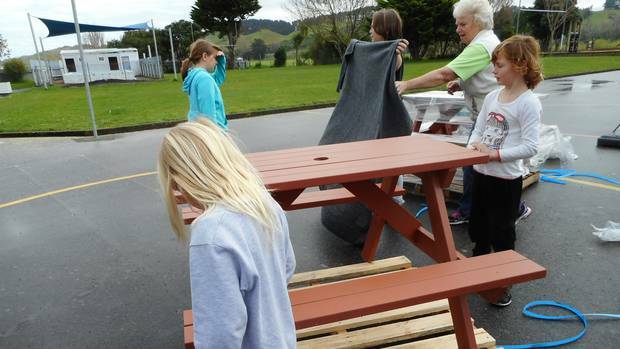 Over the past six months, students at Tamaki College had been building picnic tables. Pamaka then got in touch with a friend at Mainfreight who transported the tables from Auckland to Whangaehu School free of charge. Reddish said her pupils would be writing thank you letters to send to the Tamaki College students. Many of the Whangaehu pupils were excited to see the tables arrive and helped unwrap the big parcels. Pupils were looking forward to being able to eat their lunch outside, especially in warmer weather when they were usually inside. “We’ll be able to do our work outside instead of just having to do it inside in a hot day when we’re just all in the classroom and it’s warm and we don’t really want to be in there,” said Lucca, one of the older pupils at the school.